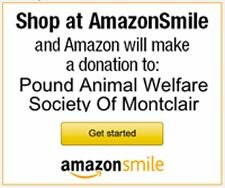 Shop online at the web sites below and help our animals. The proceeds from these purchases go to supporting cats and dogs in our care. If you shop at Amazon, use Amazon Smile. 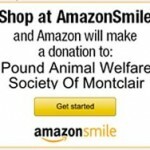 The shopping experience remains the same and The Amazon Foundation will donate a percentage of your purchase to PAWS. Our Cafe Press Shop has a great selection of PAWS merchandise. 100% of the proceeds earned from your purchases will be used to help the animals in our care. Do all your online shopping with iGive.com and a part of your purchase amount will be donated to PAWS. There are 1700+ online stores to choose from in the iGive Mall. You may already be shopping from these sites, but now a you can help PAWS at the same time! New members join before Cyber Monday will receive a free $5.00 donation. Rover lets you raise money for PAWS Montclair by doing something you do already: asking your neighbors to watch your dog instead of leaving them in a kennel. Many sitters in New Jersey donate a percentage of their earnings to nonprofits through Rover. When you book with a sitter who has the Rover Donation Badge on their profile, you’re helping local dogs in need. PAWS raises money, to care for our animals, by recycling ink jet cartridges, laser toners, cell phones, ipods, and laptops. We get up to $5.00 each for ink jet cartridge, up to $20.00 each for laser toners, up to $30.00 each for Ipods, up to $45.00 each for laptops and up to $100.00 each for cell phones. If you can help us out, please drop your cell phones in any of our drop-off areas, or any items at Petco, Verona between 11AM – 3PM the 2nd, 3rd and 4th Sat. of the month, or drop off at the Verona Civic Center. You can also leave us a message at 973-746-5212. 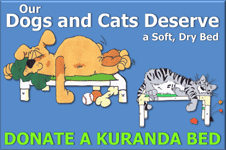 Our dogs and cats love to sleep on Kuranda beds, but we don’t have enough for everyone. If you would like to donate a bed at a special wholesale price for a another dog or cat to sleep in comfort, please donate a Kuranda bed. Buy delicious vegan chocolate and support PAWS! When you purchase from Rescue Chocolate, please type “PAWS-Montclair” into the Gift Note box on the order form. PAWS will receive $1 on every chocolate bar or truffle collection ordered.